Spectacular 2200sf mountain home on a wooded-view lot that sleeps 12 with 4 bedrooms and 3 bathrooms. Nicely furnished and decorated throughout. Large windows offer views through pine trees to the mountains in the background. Large flat screen televisions in all rooms, high speed wireless internet. •	Main floor is an open design that includes the living room with high vaulted pine ceilings and walls, dining room and a thermostat-controlled gas fireplace on a gorgeous river-rock hearth. These rooms overlook a large deck in front of the house which is perfect for that romantic, starry night. The fully stocked kitchen and bathroom have cherry cabinets and granite counters. There are two bedrooms that open to another large deck in back of the house with views of the forest. Laundry room with washer/dryer and ironing board. •	Downstairs floor has a family room with a gel memory foam sofa bed and master bedroom with a king bed. There is a 2-sided fireplace between bedroom and family room. The bathroom has a cherry wood cabinet and granite counter. •	Upstairs floor has a master bedroom with a king bed and sitting area as well as a loft with 2 twins (trundle style). The bathroom has a cherry wood cabinet with granite counters and a Jacuzzi tub. This home shows pride of ownership. Therefore, no party groups please. •	Master suite (upstairs): King Bed, Flat screen TV, Phone, Jacuzzi tub/shower, separate vanity with 2 sinks and large dressing area. •	Master suite 2(Downstairs): King Bed, Fireplace, Flat screen TV, Phone, shower with separate vanity area. •	Bedroom 3(Main floor): Queen bed, flat screen TV, slider to large deck. •	Bedroom 4 (Main floor): Queen bed, flat screen TV, slider to large deck. •	Loft (upstairs): Daybed (2 twins). •	Living/Dining combo room: Sofa sectional with lounger, 55” flat screen, high speed internet connection, gas fireplace, trestle table with seating for 8 and bar counter for 4, slider to large deck. •	Kitchen: Electric stove, microwave, dishwasher, refrigerator, toaster and coffee-maker large selection of pots, pans, bowls, etc. •	Main bathroom with tub and toilet and separate vanity area with 2 sinks. •	Laundry room inside with washer, dryer. •	2 Large decks, gas BBQ, table and chairs. •	Large driveway, with plenty of parking space. •	Backs to cross-country ski area that includes night skiing as well as the Tahoe Donner downhill ski hill less than a mile from the house (excellent for beginners). •	20 minutes from popular downhill ski areas: Squaw Valley, Alpine Meadows, Northstar, Boreal, and Sugarbowl. •	Tahoe-Donner and Coyote Moon Golf Courses. •	Trout Creek Recreation center with swimming pool, lap pool, 2 hot tubs, saunas, and exercise facility with various aerobic and weight equipment. •	Semi-private beach club on Donner Lake with paddle-boats, windsurfing, fishing, lounge chairs, snack bar and other lakeside activities. •	Equestrian center, 1 mile away. Our home is located 40 minutes from the “Biggest Little Town in the World”, Reno, featuring gambling, restaurants and world class nightly entertainment. We provide excellent customer service and we are very precise and detailed in our process of taking reservations, collecting payments, providing confirmations, emailing information, directions, and the door code, returning damage deposits, and quickly solving problems if they occur during a stay. We are always easy to reach both by phone and by email. We want your vacation to be very enjoyable and a time you will remember for a long time. We honeymooned in a mountain home in the Sierras, and wanted to keep that feeling alive. Every year we rented homes until we decided to build our own in a manner perfect for vacationers. We wanted plenty of bathrooms and we wanted the bathrooms to be able to accommodate people at the sinks while other are in the toilet/shower area. We wanted a large counter top for serving food in the kitchen/dining area with bar stools and a large eating area. We wanted a TV area with comfortable seating for many and the ability to watch TV from the kitchen/dining room. We wanted fast wireless internet throughout, an area where kids can play games away from the adults if they desired. We wanted very comfortable beds, two master bedrooms, a bedroom with a fireplace, a big garage, and parking area in the driveway for several vehicles. We wanted large decks for outdoor living with views of mountains and forestry. We chose this location and built this home to fulfill all these wants and more. In the Spring, Summer and Fall we love sitting on the large deck in the back with the large pine trees, views of the forested mountain, and spectacular sunsets. We love the Pine ceilings and looking at the trees through the windows. We also love that our place is in a mountain wonderland with great hiking trails right out the back and very few automobiles and people; and yet is is only a few short miles from swimming/water sports, golf, tennis, and shopping. 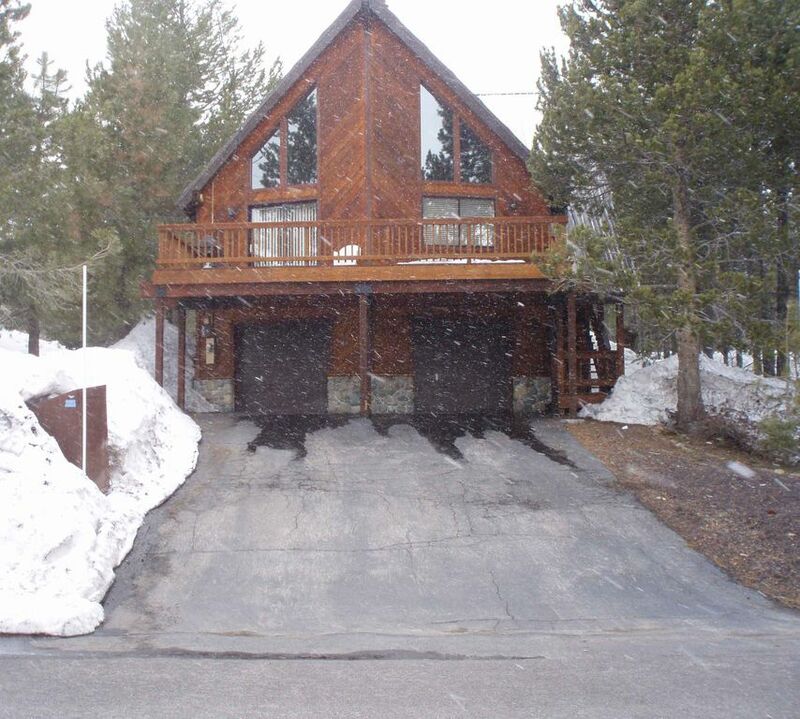 In the Winter we love that we can xcountry ski right out of our garage onto Tahoe Donner's great trail system and we can walk just one mile to the Tahoe Donner downhill ski area that is inexpensive and great for beginners. We also love that we can drive only 20 minutes to any of the big four ski areas: North Star, Squaw, Alpine, and Sugar Bowl. We also love the cozy gas fireplaces that provide lots of heat, are thermostatically controlled, and yet look like wood burning fireplaces. Backs to National Forest which is also the cross country ski area in the winter, hiking in the summer. (3) kitchen and both master suites. Kitchen with granite counters, cherry cabinets and stainless style appliances. Trestle table that can seat 8, also 4 bar stools at counter. 55" flat screen in living room. Flat screen in all bedrooms and family room. (6) On Demand digital box in Living room and downstair family room. Standard cable in all other rooms. (2) Large railed decks in front and rear of house. Tahoe Donner Ski Resort. We back to Tahoe Donner X-country. At recreation center 1 mile away. (3) At recreation center 1 mile away. About a 30-45 minute drive from most resorts, it is a prime and quiet location for any family or party. The house is fully loaded with dishes, washer and dryer, and enough bathrooms for a large group of people. The only downside is the steepness of the driveway. A few of our cars needed to be parked at the bottom of it due to the iciness of the driveway but that cant be helped due to weather. All in all, it was a great place to stay and I'd recommend anybody to book this place if it is available. My family and friends are from the Bay Area and we thought that this home would be the perfect place for our weekend getaway. Well, that was before a Blizzard arose in the forecast. Weather reports predicted low-zero visibility and urged drivers to stay off the roads. The hazardous weather conditions were in effect from Friday afternoon-Tuesday evening. Our reservation was for Friday and Saturday nights. We were not all able to take off from work to drive in the morning and if we had, we likely would have been snowed in and unable to leave for days after our planned stay. We were not willing to put our family’s safety at risk. We asked the owner if we could either get a refund or change our reservation to the next available weekend. Both requests were denied. To be fair, the cancellation policy does state “no refunds” and we received the cleaning fee back. I’m just very disappointed in the lack of understanding for this situation. An acception could have been made since we could not physically get to or have been able to leave the house during check-in/check-out. Now we are stuck with having to pick out another place and paying again so that our kids can have the snow vacation that they have been looking forward to. If you rent here during snow season, get travel insurance. Yes, we do have a very strict cancelation policy, non refundable and non transferrable. This is how we keep our rates so low. We do not have to charge you more to make up for others who cancel. We also rent two condos at Squaw Creek, and those two groups both made it up there and back over the same weekend. Probably delays on both ends, but most people who rent in the Tahoe area in February are hoping for snow, and will go the extra mile to get up there and back safely. It may mean leaving early and coming back late, and taking 5 to 6 hours instead of 3. The house has a lot of space. We had an amazing vacation at the house. The house is very accommodating and everything is close. My children enjoyed. They are ready to come back. This was a lovely house with a very livable layout that made the weekend really pleasant. Home was just right for our group of 12. The main living area is bright and open with a wonderful gas fireplace/stove for ambiance and extra heat. This is where we spent most of our time. Beds and linens are great. Location is perfect for accessing Tahoe-Donner Ski Area. Not quite a walk to ski slope but close enough. Owner is a great communicator and instructions provided for the cabin were outstanding. Security deposit refund approved the same day we left. This was a beautiful 3-story house located just 10 minutes from town. One of the biggest perks is that there is a great hiking trail just 50 yards from the backyard! Don't miss it. It was also a really nice touch that they had baby gates for those of us with little ones who try to climb up and down the stairs unsupervised. Hot tip: The shower on the bottom floor has the best water pressure. The owner was very responsive, which is always helpful. We would definitely stay here again. My wife, 1-year-old and I all thought it was awesome!